This canticle, or song, is found in the Gospel of Luke 1:46-54. 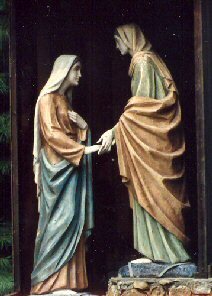 Many ancient witnesses and modern critics attribute it to have said by Mary as she arrived at the home of her cousin after learning from the angel that Elizabeth was with child. Others attribute its creation to early Palestinian Christianity because it was a suitable expression of the sentiments of Mary. "When Elizabeth heard the greeting of Mary, the babe in her womb leapt. Filled with the Holy Spirit, Elizabeth cried out, 'Blessed are you among women and blessed is the fruit of your womb. . . .' And Mary responded. . . .
generation on those who fear him. thrones, and has exalted the lowly. to Abraham and to his posterity forever."